Being able to participate in such a significant life-changing endeavor as the 2016 Ride4Gabe was certainly the highlight of my cycling year, and that led spontaneously to the establishment of a primary goal for 2016 – to ride in every county in Alabama in one year. I set this goal when I joined Michael Staley, Wes Bates, and Payne Griffin for the Alabama stretch of Ride4Gabe – a 2000+ mile ride from the Canadian border in Maine to the USS Alabama at Battleship Park in Mobile, Alabama. 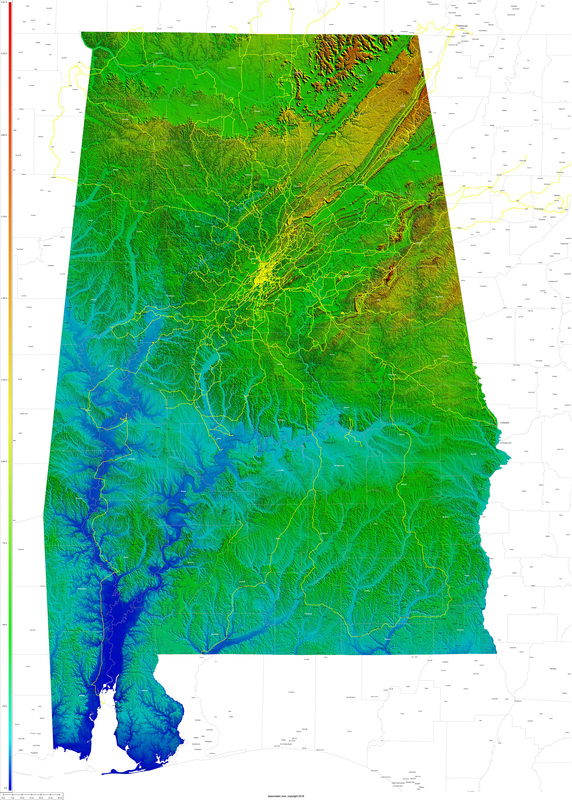 I realized during the ride that if I biked back to Birmingham after the finish in Mobile and veered west along the Mississippi border, I would hit counties that I can’t normally reach from Birmingham on my training rides. Similarly, I was only able to reach the counties in southeastern Alabama via a two day 500+ mile loop during Fall Break with my 2017 Race Across America crew chief Jeffrey White providing support. 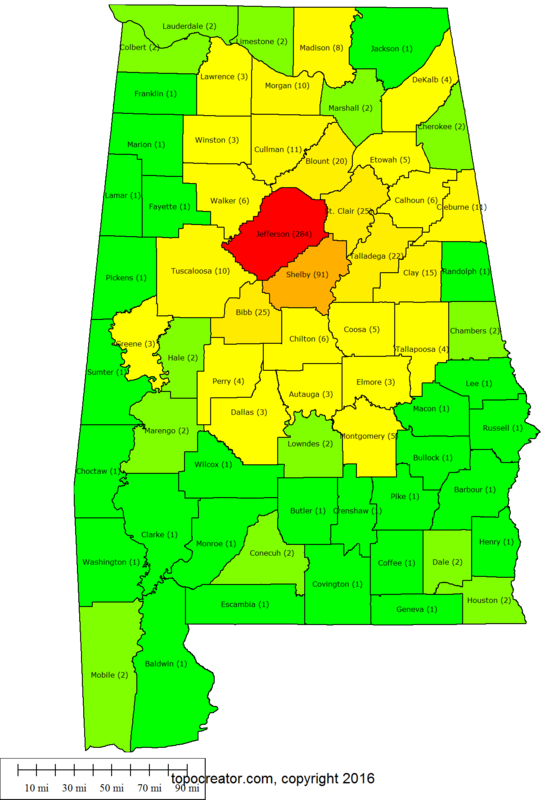 2016 county heat map covering ALL of Alabama in one year! Numbers in parentheses are the number of different rides that entered the county. Topocreator map of all my rides in 2016 that started and/or ended in Alabama. Click the image to zoom in or to see even more detail, download super hi-res (41MB) version. All these stats are based on the calendar year January 1st – December 31st. With only nine races this year, this has been the least amount of racing I’ve done in some time. Still, it was a great year of racing highlighted by winning the Skyway Epic 100 mile mountain bike race in April. I’ve finished 2nd every time I raced this race, but finally pulled out the win this year. I tried to follow this up the next day with a road racing adventure by riding to the start of the Tour de Tuscaloosa Road Race, racing the Pro/1/2 road race, and then planning to ride home afterwards. I was so wiped out by the end of the race, though, that I caught a ride back to Birmingham with my friend Chris Winslett. This entry was posted in Adventure, Off-season, Racing, Training and tagged maps, statistics on February 3, 2017 by kartoone. End of the Appalachians – I wonder if the Bibb County Sand Mountain is the last categorized climb of the Appalachian Mountains. Made it to the top of Sand Mountain on the backside of Tannehill. If you follow my instagram account, then you know that I’ve posted the picture of “The End of the Appalachians” sign several times. This sign is located in Tannehill State Park. The best reason I can figure as to why the Appalachian Mountains end right there is because of Mud Creek slicing through the remnants of the merged ridge lines of Red Mountain and Shades Mountain. I’m guessing that everything south and west of that point is considered “hills” that are formed from a different process than that of the Appalachian Mountains. Just past Bishop Ridge on Bibb County 12 is a couple climbs over two small ridges. The second climb is the larger of the two and it continues on up and to the right all the way to the back border of the state park. 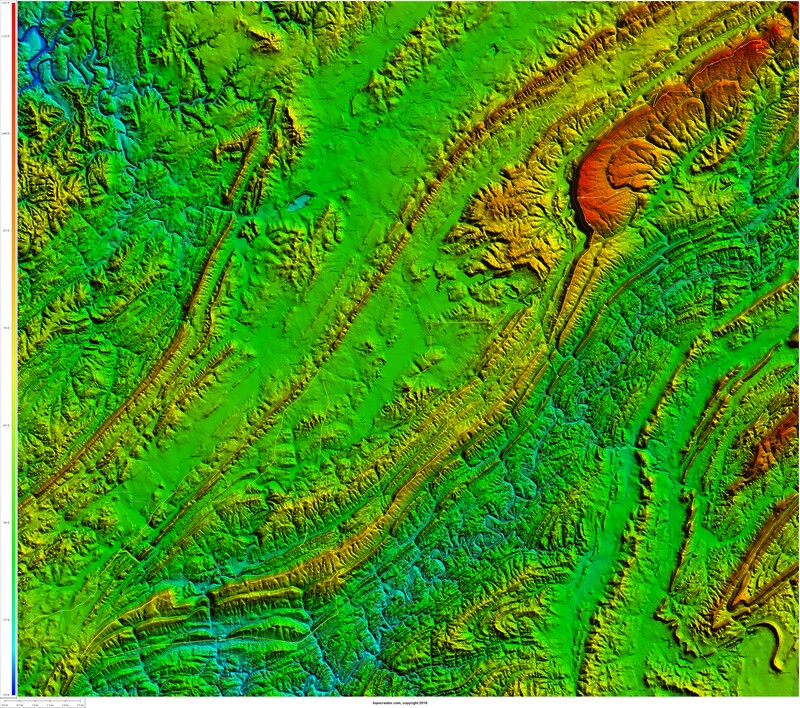 This ridge is called “Sand Mountain” according to the USGS places dataset. Starting from near the intersection with Bishop Ridge and climbing all the way up to the first high point on Sand Mountain is a bare minimum Cat 4 climb. I’m wondering if it is the last categorized climb in the Appalachian Mountains. I’ve included a topocreator map below of my entire ride (4 county loop that I call the “reverse western” loop). The satellite imagery in the first map is 2015 data. The USGS elevation dataset is a bit older as some quarries which have been filled in by water still show as deep spots and other quarries which have been dug since the elevation dataset was created don’t show up at all. These maps are both huge (20MB and 17MB) so you can see tons of detail if you download the JPG and use an image editing or preview program to zoom in. 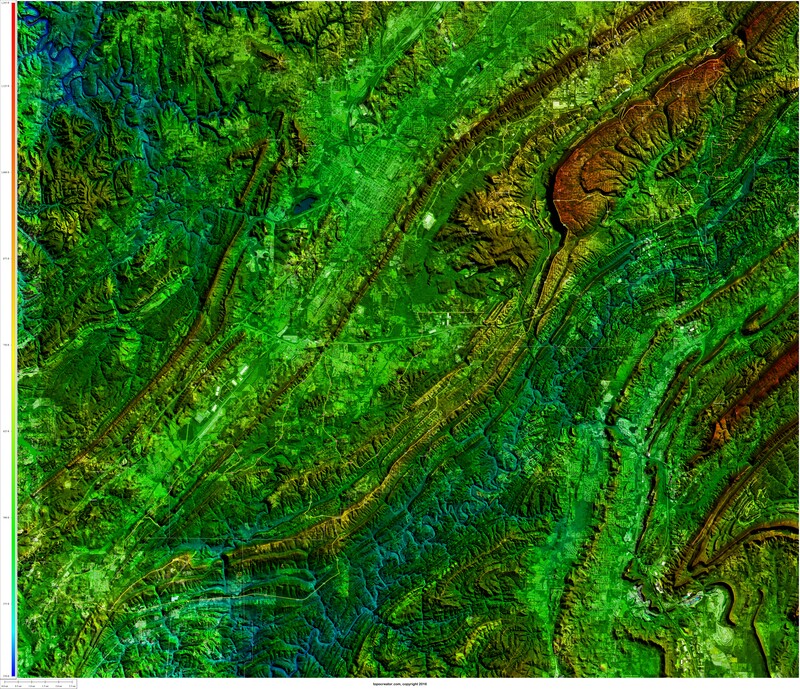 Topocreator map with satellite imagery zoomed in. The “end of the appalachians” is the spur from my route down in the lower left. Sand Mountain is also down there. Click to enlarge and see detail. Topocreator.com map of my 4-county “western reverse” loop. Click to enlarge and see detail. This entry was posted in Adventure, Training and tagged maps on February 24, 2016 by kartoone.